However, I found that they were a bit unwieldy and didn’t have a top shelf backing, so paints would fall off…Also, I had to cut small blocks of foam as risers for the deep shelves to stack the paints two deep. They worked, but weren’t idea. I then looked at the woodcut lines out there. So many nice products for storing paints, but none did what I wanted them to (I’m sure someone can show me otherwise, but I didn’t find what fit my need), which was mainly allow the varying sizes of hobby paint bottle in each slot. I use P3, Vallejo, GW, and Army Painter – plus a few random off brands. None seemed to be all things for me. The quest continued. Finally I saw someone using nail polish racks in an image or two. Was amazed by the simplicity of the idea! Did a bit of research of the depth of the shelves I wanted and went to town. Bought a couple from Container Store that were lower as a starting point, then bought a taller rack from Amazon. I’ve since swapped out two of the smaller racks for two tall racks and the results are below. I did a couple fast pictures to show how things stand, please forgive the clutter. 🙂 The two shorter racks now hold my black/gray and metallics in one and the technicals and washes in the other. The tall racks hold everything else. All my moving things around has me needing to resort the colors and pull duplicates out for now. Started working on my Blood and Plunder English pirates. After the announced death of Spartan Games my interest in finishing my Russian fleet sort of waned. Enjoying working on some simple sculpts for a change, not enjoying reteaching myself how best to paint over white primer. Trying to color block out the pants/shirts ahead of time as well. These are English Freebooters. Kind of heavy handed with my base coating, but end results will be good. Well, that’s a bummer. If you’re unaware Spartan Games has closed up shop. Our local group has been debating on what to do with our fleets, hopefully we’ll hold onto them and play the game, but has definitely put a damper on desire to play it at the moment. A few of us are looking for some of the items we had considered picking up when we started playing it regularly again, but it was never the easiest game to locate product for at the best of times…ugh. 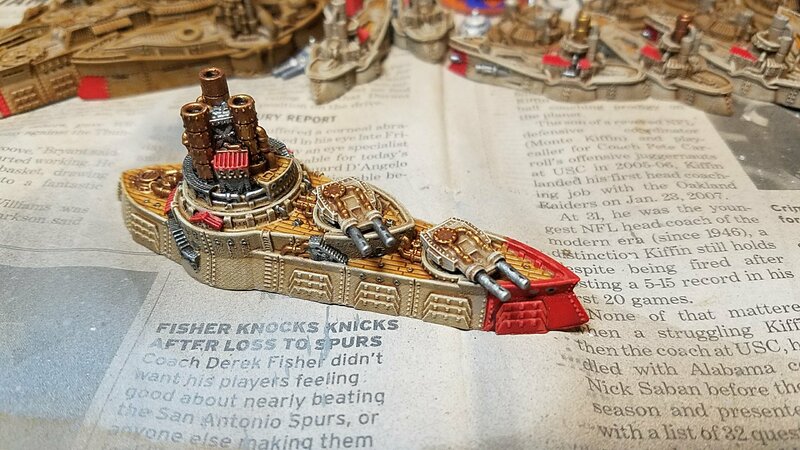 Spent a good length of time messing with color ideas for my Russian Dystopian Wars fleet. Nothing fancy, but I like the warm browns and the red. Hopefully I’ll be quicker on the rest.